The student of the group BZhD-14-1 Asylmurat Z.K. 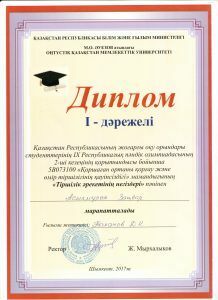 I took 1st place in the 9th Republican Olympiad in the subject “Fundamentals of Life Safety”, March 2017. (South-Kazakhstan State University named after M.Auezov). In April 2018, it is planned to train 1 MD student of SVA-17m group in St. Petersburg and 2 MD students of this group in Bishkek. From April 19 to 20, 2018, the second stage of the X Republican interuniversity subject Olympiad among students of the specialty 5B073100 “Safety of vital activity and environmental protection” was held at the Department of RA and OT on the disciplines “Life Safety” and “Fire Safety”. The Organizing Committee for the preparation and holding of the X Republican Inter-University Subject Olympiad, the jury for the disciplines “Fire Safety” and “Life Safety”, the mandate commission for the disciplines “Fire Safety” and “Life Safety”, the Appeal Commission for the disciplines “Fire Safety” and ” Safety of life “. The Olympics consists of two rounds. In the first round, students perform test tasks. Test tasks include 60 questions. The time allotted for testing is 180 minutes. Students who showed the best results are in the second round. In the second round, students perform the assignment in writing. The assignment consists of 5 questions. The time allotted for the task is 120 minutes. 35 students of the leading 12 universities of the Republic of Kazakhstan (KSU named after M.Tynyshpayev, S.Toraigyrov University, M.Auezov State University, Al-Farabi Kazakh National University, took part in the Olympiad). S. Amanzholova, A.Myrzakhmetov KokU, Zhangir Khan ZKATU, KI Satpayev KazNIU, KazNAU, M.H. Dulati TarSU, Hodja Ahmed Yasawi MCTU, D.Serikbayev EKSTU . etc.). – students of SVA specialties.